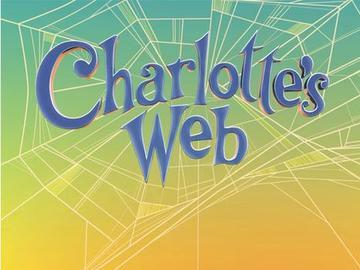 Salisbury, NC -- The Children's Literature Association called Charlotte’s Web "the best American children's book of the past two hundred years!" This fall the stage version of E.B. White’s 1952 novel, adapted by Joseph Robinette, will be presented in a fun inventive stage. Charlotte’s Web is the story of a rambunctious pig named Wilbur and an unlikely friendship. After being sold to Mr. Zuckerman and moved to his farm, Wilbur left yearning for companionship after being snubbed by the other barn animals; until a barn spider named Charlotte, befriends him. When it becomes clear that Wilbur is destined for slaughter, Charlotte begins a campaign to save Wilbur by weaving messages in her web in an attempt to persuade the farmer to let him live. With the help of Templeton the rat, and other barnyard friends, the once “runt of the litter” becomes the prize-winning pig of the County Fair and the most famous pig ever. Charlotte’s Web is a special collaborative Arts & Ag event in partnership with the Rowan County Tourism Development Authority, Patterson Farms and Piedmont Players Theatre. This special production will be performed at Patterson Farm in the barn. The farm's normal fall activities, including the corn MAiZE, will be available before or after the production. Performances are October 13 and 14 at 1:30pm and 3:30pm. Performance Ticket Prices: $2.50 and are in addition to Fall Fun on the Farm Admission. Under 2 are free. Read more about Arts and Ag at www.rowanartsandag.com. Tickets are on sale now at www.visitpattersonfarm.com. Cost $2.50 plus tax per person in addition to Fall Fun on the Farm Admission. Children under 2 are FREE.